This article is about Afghan immigrants in Pakistan. It is not to be confused with the Pashtuns of Pakistan. Afghans in Pakistan (Urdu: افغان مهاجرين‎, Afghan Muhajreen) primarily constitute refugees who have fled wars in Afghanistan, but there are small numbers of Afghan asylum seekers, migrant workers, merchants, businesspeople, exchange students and diplomats. Most were born and raised in Pakistan and are under age 30, but are still considered citizens of Afghanistan. They are under the protection of the United Nations High Commissioner for Refugees (UNHCR), and have been given legal status in Pakistan until the end of 2017. The first wave of Afghan refugees to Pakistan began during the Soviet–Afghan War in the late 1970s. By the end of 2001, there were over four million. Most have returned to Afghanistan since 2002. The UNHCR reported in February 2017 that about 1.3 million registered Afghan citizens still remained in Pakistan, distributed as follows: Khyber Pakhtunkhwa (81 percent); Punjab (10 percent); Balochistan (seven percent) and Sindh (one percent). The border between Afghanistan and Pakistan is the Durand Line. Nearly all Afghan refugee camps are located in Pakistan's Khyber Pakhtunkhwa and Balochistan and the Federally Administered Tribal Areas (FATA) (in blue). ... an extensive country of Asia ... between Persia and the Indies, and in the other direction between the Hindu Kush and the Indian Ocean. It formerly included the Persian provinces of Khorassan and Kohistan, together with Herat, Beluchistan, Cashmere, and Sinde, and a considerable part of the Punjab ... Its principal cities are Kabul, the capital, Ghuznee, Peshawer, and Kandahar. Interaction and migration by the region's native people were common. After the Second Anglo-Afghan War, the late-19th-century Durand Line demarcated the spheres of influence of British India's Mortimer Durand and the Afghan amir Abdur Rahman Khan. The single-page agreement in 1947 ending political interference beyond the frontier between Afghanistan and the British Indian Empire, inherited by Pakistan in 1947, divided the indigenous Pashtun and Baloch tribes. During the 1980s Soviet–Afghan War, many Afghans left their country. As a result of political unrest, mass arrests, executions and other human-rights violations and civil war, about three million Afghan refugees escaped to Pakistan and about two million to Iran. The migration began in December 1979 (when the Soviet Union invaded Afghanistan with over 100,000 troops), and continued through the 1980s. In late 1988, about 3.3 million Afghan refugees were housed in 340 refugee camps along the Afghan-Pakistan border in Khyber Pakhtunkhwa (KP). It was reported by The New York Times in November 1988 that about 100,000 refugees lived in Peshawar and more than two million lived in KP (known as the North-West Frontier Province at the time). On the outskirts of Peshawar, the Jalozai camp was one of the largest refugee camps in the NWFP. According to one researcher, the refugees were those "who came from politically prominent and wealthy families with personal and business assets outside Afghanistan; a small group who arrived with assets that they could bring with them such as trucks, cars and limited funds and who have done relatively well in Pakistan integrating into the new society and engaging successfully in commerce; those refugees who came from the ranks of the well-educated and include professionals such as doctors, engineers and teachers; refugees who escaped with household goods and herds of sheep, cattle and yaks but for the most part must be helped to maintain themselves; the fifth and the largest group, constituting about 60 per cent of the refugees, are ordinary Afghans who arrived with nothing and are largely dependent on Pakistan and international efforts for sustenance." After the September 11 attacks, when US-led forces began bombing al-Qaeda and Taliban targets in Afghanistan, a small number of Afghans fled into Pakistan. They included foreign militant groups (al-Qaeda), local Taliban members and Afghan civilians who feared being caught up in the bombings. By the end of 2001 there were about five million Afghan refugees in Pakistan, including those born in Pakistan during the previous 20 years. The Afghan diaspora in Pakistan was the largest group of Afghans living outside the country at the time. It was projected that the number would increase due to the US-led intervention. As of 2016, over 4.3 million Afghans were repatriated from Pakistan through the UNHCR since March 2002. According to Census of Afghans in Pakistan, a 2005 Pakistani Ministry of States and Frontier Regions report, the ethnic breakdown of Afghans in Pakistan was Pashtuns (81.5 percent), Tajiks (7.3 percent), Uzbeks (2.3 percent), Hazara (1.3 percent), Turkmen (2.0 percent), Balochi (1.7 percent) and others (3.9 percent). The government of Pakistan receives $133 million per year ($78 per person) from the UNHCR for hosting Afghans. In 2005 the government of Pakistan began registering Afghans, and the number of registered Afghans was reported at 2.15 million in February 2007. They received computer-generated "proof of registration" (PoR) cards with biometric features—similar to the Pakistani Computerised National Identity Card (CNIC) but with "Afghan Citizen" on its front. More than 357,000 Afghans were repatriated from Pakistan in 2007, and Afghans were repatriated between March and October of each subsequent year. Returnees were reportedly to be given land by the Afghan government to build a home, and each person received a travel package worth about $100 (which was increased to $400). About 80 percent of the returnees came from Khyber Pakhtunkhwa, 13 percent from Balochistan, three percent from Sindh and the remaining four percent from Punjab and Pakistan's capital, Islamabad. In June 2010 Pakistan ratified the United Nations Convention against Torture, which forbids member states from deporting, extraditing or returning people where there is reason to believe they will be tortured. The government of Khyber Pakhtunkhwa has increased its efforts toward a large-scale deportation of Afghan refugees from the province. The Afghan minister of refugees and repatriation announced that his ministry would establish 48 towns in Afghanistan for refugees returning from Pakistan and Iran. Between 2010 and the end of 2012, a reported 229,000 Afghan refugees returned from Pakistan. Some Pakistani officials have estimated that 400,000 non-registered Afghans may be living in their country. A total of 380,884 Afghan refugees left Pakistan for Afghanistan in 2016. Most were born and raised in Pakistan, but are still counted as citizens of Afghanistan. The UNHCR reported in February 2017 that about 1.3 million registered Afghans still remained in Pakistan. They are allowed to work, rent housing, travel and attend schools in the country until the end of 2017. A small number of refugees are asylum seekers who are waiting to be resettled in North America, Australia and the European Union. A number of Afghan passport holders travel to Pakistan with a visa for a variety of reasons, including family visits, business, medical purposes, sport competitions, education, tourism, or to visit foreign embassies. The visa, free of charge, is usually valid for three months. Since the 1980s, Afghans and Pakistanis were accustomed to crossing the border between their countries without passports or visas. In March 2012, Pakistan ended its visa-extension program. As of January 2017 Pakistan and Afghanistan forbade entrance to their countries without a valid passport and visa, and Pakistan has introduced a "visa regime for different categories of Afghan nationals." Karim Sadiq of the Afghanistan national cricket team lived in Pakistan. Hasti Gul, another member of the Afghanistan national cricket team, lived in Peshawar. Most Afghans are found in Pashtun-dominated areas of Pakistan, which includes Khyber Pakhtunkhwa, the Federally Administered Tribal Areas (FATA) and the city of Quetta in northern Balochistan. Smaller communities exist in Karachi, Rawalpindi, Islamabad and Lahore. Eighty-five percent of Afghan refugees in Pakistan are Pashtuns, and the remaining 15 percent are Uzbeks, Tajiks and members of other ethnic groups. Khyber Pakhtunkhwa hosts the largest Afghan refugee population (62.1 percent), followed by Balochistan (30.3 percent), Punjab (4.2 percent), Sindh (4.2 percent), Islamabad (two percent) and Azad Kashmir (0.4 percent). During the 1980s Soviet–Afghan War, Peshawar was a center for Afghan refugees. The Jalozai refugee camp alone hosted an Afghan population of 100,000 during the 1988 election when Benazir Bhutto campaigned for Prime Minister of Pakistan. Peshawar assimilated many Pashtun Afghans with relative ease, since the city shares historic and cultural ties with Afghanistan, and the city became home to many Afghan musicians and artists. After Peshawar, Quetta has the second-highest percentage of Afghan refugees (20 percent). Most Afghans in Quetta are engaged in business and work in the city. Balochistan shares demographics with Afghanistan, and many refugees have migrated to the province for ethnic links. A 2005 census of Afghans in Balochistan indicated that the overwhelming majority were Pashtun, followed by Uzbeks, Tajiks, Baluchis, Hazaras and Turkmen. Quetta has the largest concentration of Hazara people outside Afghanistan, based in areas such as Hazara Town. Due to social unrest and Hazara persecution, the Afghan refugees are trying to resettle in other countries such as Australia. The first wave of Afghan Hazaras arrived during the 1980s Soviet war, and more arrived fleeing persecution by the Taliban regime in the 1990s. They forged closer links with their Pakistani Hazara patrons, whose ancestors had arrived during Amir Abdur Rahman Khan's reign in the late 1800s (when Quetta was part of Afghanistan); these Pakistani Hazaras have some influence in the Balochistan government. Instead of living in settlement camps, many Hazaras have settled in cities. According to the UNHCR and local law enforcement, about 50,000 Afghan refugees lived in Sindh in 2009. A UNHCR spokesman said, "Sindh is home to some 50,000 Afghan refugees and most of them are staying in Karachi". "The police can move only against unregistered Afghans, whose number is very small in Karachi", said a senior Karachi police official. In Karachi, Afghans are found primarily in Pashtun-dominated suburbs such as Sohrab Goth. Before 2006 about 25,000 Afghans lived in a refugee camp in the Islamabad Capital Territory. The camp was closed, its refugees relocated and 7,335 Afghans were reportedly living in Rawalpindi. In 2009, it was reported that the UNHCR helped about 3,000 refugees move from the slums of Islamabad to an undeveloped plot of land in a green belt on the edge of the city. An estimated 150,000 Afghans live in Pakistan's Punjab province. In June 2007, the National Database and Registration Authority (NADRA) registered 16,439 Afghans in the eastern Pakistani city of Lahore; their number was reported at about 7,000 in October 2004. Some poor Afghans reportedly began leaving for Afghanistan in October 2001 to fight the United States invasion of Afghanistan, and other Afghans arrived in Lahore to escape the US-led bombing of Afghanistan. During the 1980s, about 13,000 Afghans migrated to cities in Azad Kashmir. According to a 2011 article in The News International, Afghans and other foreigners in Azad Kashmir were perceived as a security risk. In 2015, there were 11,000 unregistered Afghan refugees in Azad Kashmir who faced possible expulsion or deportation. Afghan ethnic groups from the Wakhan Corridor have historically migrated to the Gilgit–Baltistan region of northern Pakistan. 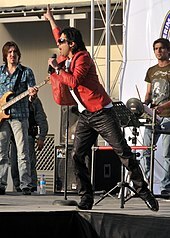 Aryan Khan, a TV personality in Afghanistan, lived in Pakistan. Although most Afghans live in refugee camps near the Pakistan-Afghan border and have little contact with Pakistani society and culture, some travel to nearby cities for work or other purposes. The population of Pakistan was about 180 million in 2012, making it the world's sixth-most-populous country. Due to political unrest in Pakistan, energy crises, unemployment and strained relations between Pakistan and Afghanistan, Afghan immigrants are viewed as an additional economic and social burden on Pakistan. With the Pakistani population, Afghan refugees were affected by the 2005 earthquake and 2010 floods. Afghans who migrated to Pakistan in the aftermath of the Soviet invasion are settled in the country and would face socioeconomic problems in moving back to Afghanistan, including difficulty finding shelter and jobs. Second- and third-generation refugees, born and raised in Pakistan, would be unable to easily assimilate in Afghanistan. Due to historical, ethnic and linguistic connections, Afghan immigrants in Pakistan find it relatively easy to adapt to local customs and culture and there are few obstacles to transition and assimilation into mainstream society; culture shock for Afghans who settle in Pakistan is relatively minor. An increasing number of Afghan immigrants have Urdu, Pakistan's national language, as their second or third language and speak it fluently. Many Afghans born and raised in Pakistan identify as Pakistani, and refer to Pakistan as their home. They participate in national festivities and other occasions, including Independence Day celebrations. Afghan communities retain and preserve their cultural values, traditions and customs, despite years of fighting and difficult socioeconomic conditions in Afghanistan. Shared Pashtun and other cultures in the two countries make it easier for Afghans to feel comfortable in Pakistan. At least 71 percent of registered Afghans had no formal education, and only 20 percent were in the labour market. Despite economic hardships and challenges in Pakistan, many Afghans are unwilling to return in the near future and cite security concerns and the lack of housing and jobs in Afghanistan. About 6,500 Afghans studied at Pakistani universities in 2011, with 729 exchange students receiving scholarships from the government of Pakistan. A number of Afghan schools throughout Pakistan educate thousands of Afghan refugee children. Wealthier Afghans live in cities, renting houses, driving cars and working in offices or running their own businesses; their children are enrolled in better schools and universities. Many receive remittances from family or friends living abroad; thousands of Kennedy Fried Chicken owners and workers in the eastern US transfer money every month to their extended families in Pakistan. Self-employed Afghans in Pakistan are usually involved in the Afghan rug business, Afghan restaurants and bakeries (making and selling Afghan bread), international trade, auto sales or small shops. A number of Afghans are involved in Pakistani media and entertainment as television hosts, actors and news anchors. Najiba Faiz, originally from Kunduz, is popular on AVT Khyber and other stations. Some Afghans drive taxicabs or sell fruit and other products, and others work in five-star hotels such as the Serena and the Marriott. Many work in factories or as employees of Pakistani shop owners. According to a 2007 report, Afghans were willing to work for lower wages than the average Pakistani. Afghan labour is common in transport and construction. Most Afghans did not pay taxes while living in Pakistan, an economic concern; in Peshawar, 12,000 Afghan nationals were in business without paying taxes. To address these concerns, the Federal Board of Revenue implemented measures to tax Afghan traders. Afghan refugees in Pakistan are helped by the UNHCR, UNICEF, the World Health Organization (WHO), USAID and other aid agencies. In October 2011, Prime Minister of Pakistan Yousaf Raza Gilani cited migration from Afghanistan to Pakistan as a factor in the spread of polio in the country. According to Gilani, vaccinating all the children in refugee camps and nearby villages in the "inhospitable" terrain along the Pakistan-Afghanistan border was very difficult and he requested assistance from the international community during a trip to the United Kingdom. Cricket in Afghanistan has been promoted by repatriated Afghans, who were influenced by the game while they lived in Pakistan; most players on the Afghanistan national cricket team are former refugees. Afghan cricket teams such as the Afghan Cheetahs frequently participate in domestic Pakistani tournaments. Afghans living in Pakistan are vulnerable to persecution, and are often targeted by Pakistani authorities. After the 2014 Peshawar school massacre by members of Pakistan's Tehrik-i-Taliban, the government of Pakistan decided to deport tens of thousands of Afghan refugees. The strain on relations between Pakistan and Afghanistan and Afghanistan's relations with India have also contributed to anti-Afghan sentiment. The influx of Afghan refugees into Pakistan since the 1980s has contributed to increased sectarian violence, drug trafficking, terrorism and organised crime. According to the Pakistan Citizenship Act 1951, people who migrated to Pakistan before 18 April 1951 (and their descendants) are Pakistani citizens. Although the act was directed at Muhajir settlers who arrived in Pakistan following the partition of India in 1947, it generally included all migrant groups (including Afghans). Those who immigrated after this date are required to apply for Pakistani citizenship and identity documents. It is estimated that over 200,000 Afghans who arrived after 1951 have obtained Pakistani citizenship and identity documents, such as Computerized National Identity Cards (CNICs), without formal applications. In 2015, Pakistani authorities pledged to invalidate the documents, making older Afghans illegal immigrants. National Database and Registration Authority and passport officials, union councils and political activists were found to have created fake identities and sell Pakistani national identity cards to Afghan migrants. Thousands of Afghans were reportedly in Pakistani jails in May 2011, most of whom were arrested for offenses ranging from petty crimes to not having a proof of registration (PoR) card, Pakistani visa or Afghan passport. In 2007, 337 Afghan nationals "were arrested for illegally travelling to Saudi Arabia to perform Hajj on fake Pakistani passports. After serving prison sentences and paying fines, they were released on "the condition they will not enter Pakistan illegally again." In 2012, 278 Afghan nationals were arrested by intelligence agencies for possessing fake Pakistani CNICs. According to the Khyber Pakhtunkhwa Home and Tribal Affairs Department, "A number of Afghan refugees (have) managed to obtain fake CNICs from different National Database and Registration Authority (NADRA) offices, especially from Zhob, Loralai, Bhakkar, Muzafargarh, Thatta and Dera Ismail Khan". Khyber Pakhtunkhwa officials said that action would be taken against the Afghans and the Pakistanis who were involved in the fraud. "We have issued instructions to NADRA to start screening all the CNICs issued, which would help identify fake CNICs", a department official said. Several Afghans were arrested by the Federal Investigation Agency at a passport office in Lahore involved in issuing fraudulent Pakistani CNICs and passports. According to sources, Afghan immigrants could pay as much as Rs150,000 to Rs200,000 to obtain Pakistani nationality documents. Issuing CNICs to the remaining registered Afghan nationals residing in Pakistan, many of which were born inside Pakistan, has been debated. Several Pakistani politicians objected to the idea; one said, "They have overstayed their welcome, scattered across our cities and taken up our jobs". The Pakistan Falah Party led a July 2016 protest against Afghan nationals in Haripur. 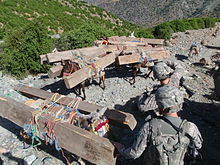 US Army soldiers intercept illegal lumber smuggled through Kunar Province in Afghanistan into neighboring Pakistan. Smuggling became a major business after the establishment of the Durand Line in 1893, which is now controlled by a large organized-crime network on both sides of the border. Major items smuggled from Afghanistan into Pakistan are opium, hashish, heroin, lumber, precious stones, copper, automobiles and electronics. The drugs trade and opium production in Afghanistan have taken a toll on Pakistan. According to a 2001 report, the Islamic Emirate of Afghanistan (the Taliban government) have been unable to stop the refining and export of heroin stockpiles through its borders. The immediate result has been the extensive smuggling of drugs into Pakistan. However, recent reports indicate that 90 percent of heroin from Afghanistan is smuggled into Central Asia. Another form of smuggling is human trafficking. According to one report, asylum-seeking Afghans, Iranians and others wanting to reach Malaysia pay up to $10,000 to Pakistani human smugglers in Karachi. According to a Pakistani government assessment, more than 90 percent of terrorist attacks in Pakistan are traced to Afghan refugee camps and several Afghan nationals have been arrested for involvement in the attacks. Afghan militants sometimes enter Pakistan's border regions for shelter. Due to Pakistan's porous border with Afghanistan, it is difficult for local authorities and security agencies to track the movement of Afghan militants into the country. In 2003, 246 Taliban were arrested in a Quetta hospital after they were wounded in Afghanistan: "Forty-seven of the arrested Afghani elements have been handed over to the Afghan government, while the remaining detainees are being investigated by the security apparatus". 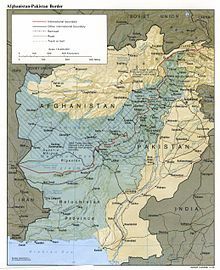 After the Soviet invasion of Afghanistan in the late 1970s, Pakistan's government under Zia-ul-Haq (in conjunction with the United States and Saudi Arabia) supported Afghan mujahideen forces with weapons to fight the Soviet-backed Afghan government. Operation Cyclone is regarded as contributing to the start of militant activities in Pakistan's tribal areas. American drone attacks in Pakistan often target members of militant groups (the Haqqani network, Hezb-e-Islami, the Taliban, al-Qaida, Chechens and the Islamic Movement of Uzbekistan) hiding in Pakistan's bordering tribal areas, near Afghan refugee camps. Several Afghan refugees have been charged by Pakistani authorities with terrorism-related activities in Pakistan. The 2009 Lahore police academy attacks, blamed on the Pakistani militant groups (Fedayeen al-Islam and Tehrik-i-Taliban Pakistan), involved one Afghan who received a 10-year sentence. In the 2011 Dera Ghazi Khan bombings, a teenaged Afghan boy (Fida Hussain) from the tribal areas was arrested as a suspect. A group of militants was involved in the 2015 Camp Badaber attack. Some Afghans have been captured while attempting to recruit and smuggle people for militancy in Afghanistan. After the December 2014 Peshawar school massacre, the deadliest terrorist incident in Pakistan's history (in which two Afghan militants were involved), Pakistani authorities cracked down on Afghan refugee settlements to apprehend illegal immigrants. At least 30,000 Afghans left for Afghanistan, of whom nearly 2,000 were deported due to a lack of legal documentation. In February 2015. over 1,000 Afghans per day were reportedly returning to Afghanistan at Torkham Crossing. By September 2015, over 137,000 Afghans had returned to Afghanistan. ^ a b c d "PAKISTAN: Tolerance wanes as perceptions of Afghan refugees change". Irin. February 27, 2012. Retrieved February 28, 2012. ^ "Summary of Legal Assistance and Aid Programme". UNHCR. 2016. Retrieved 19 February 2017. ^ "Refugee Affected and Hosting Areas Programme" (PDF). RAHA Brochure 2016. UNHCR. Retrieved February 20, 2017. ^ a b "Visa extension to foreigners banned". Archived from the original on 2012-03-14. Retrieved 2012-03-13. ^ "No more visa extensions for foreigners in Pakistan". Pakistan Today. February 17, 2012. Retrieved February 17, 2012. ^ Barker, Memphis (2018-09-17). "Pakistan's Imran Khan pledges citizenship for 1.5m Afghan refugees". the Guardian. Retrieved 2018-09-17. ^ Gul, Mahwish. "The debate that never was". D+C, Development and cooperation. ^ Friedrich Engels (1857). "Afghanistan". Andy Blunden. The New American Cyclopaedia, Vol. I. Retrieved August 25, 2010. The principal cities of Afghanistan are Kabul, the capital, Ghuznee, Peshawer, and Kandahar. ^ Smith, Cynthia (August 2004). "A Selection of Historical Maps of Afghanistan – The Durand Line". United States: Library of Congress. Archived from the original on 6 February 2011. Retrieved 2011-02-11. ^ Donatella Lorch, ed. (August 1, 2001). "Afghan Refugees in Pakistan at Risk". UNHCR. Retrieved June 3, 2012. ^ Sobia Nisar, ed. (October 13, 2001). "Afghan Refugees Influx into Pakistan". Media Monitor Network. Retrieved June 3, 2012. ^ Donatella Lorch, ed. (November 16, 1988). "Pakistan Restricts Afghan Refugees". The New York Times. Retrieved March 13, 2012. ^ a b "NADRA Asks Afghans to Renew PoR Cards before Deadline". National Database and Registration Authority (NADRA). February 25, 2011. Retrieved June 3, 2012. ^ United Nations High Commissioner for Refugees (2007-05-29). "German foreign minister explores situation of Afghans in Pakistan". UNHCR. Retrieved 2012-01-21. ^ United Nations High Commissioner for Refugees. "Over 350,000 Afghans repatriate from Pakistan before winter". UNHCR. Retrieved 2012-01-21. ^ "Returnees to be allotted plots: Helmand governor". Pajhwok Afghan News. November 4, 2007. Retrieved 27 January 2010. ^ United Nations High Commissioner for Refugees. "Afghanistan: Winter break for voluntary returns from Pakistan". UNHCR. Retrieved 2012-01-21. ^ "Afghans face mass deportation from Pakistan". Express Tribune. 29 June 2012. Retrieved 29 June 2012. ^ "48 towns to be established for Afghan refugees: Anwari". Pajhwok Afghan News. 5 December 2012. Retrieved 30 March 2013. ^ "Over 60,000 refugees return home this year". Pajhwok Afghan News. October 29, 2011. Retrieved November 12, 2011. ^ Nearly 83,000 Afghan refugees return home from Pakistan this year, 2012-12-05. ^ Diplomat, Umair Jamal, The. "Why Is Pakistan Expelling Afghan Refugees?". The Diplomat. Retrieved 2017-01-27. ^ "Asylmarsj.no". Asylmarsj.no. Retrieved 2012-01-21. ^ a b "Pakistan, Afghanistan discuss prisoner swap". Pajhwok Afghan News. May 31, 2011. Retrieved November 12, 2011. ^ "Three million Afghans to be expelled by December". Express Tribune. 18 July 2012. Retrieved 18 July 2012. ^ DONATELLA LORCH (November 16, 1988). "Pakistan Restricts Afghan Refugees". New York Times. Archived from the original on 30 January 2010. Retrieved 27 January 2010. ^ a b c KARACHI: UN body, police baffled by minister’s threat against Afghan refugees, Dawn. February 10, 2009. ^ "People's Daily Online – Pakistan asks Afghans to go back or shift to camp". English.peopledaily.com.cn. 2006-05-09. Retrieved 2012-01-21. ^ United Nations High Commissioner for Refugees (8 December 2009). "Some 3,000 Afghan refugees to leave Islamabad slum for new home". UNHCR. Retrieved 2012-01-21. ^ Shah, Benazir (2 March 2017). "Afghans in Punjab: 'The police are a little confused'". GEO News. Archived from the original on 6 May 2017. Retrieved 6 May 2017. ^ "Foreigners, Afghans major threat in AJK'". Thenews.com.pk. Retrieved 2012-01-21. ^ "Azad Kashmir to expel 11,000 Afghans: police". The Express Tribune. 2 April 2015. Retrieved 3 April 2015. ^ "Afghan refugees in Pakistan face risks in flood recovery". Archived from the original on 2010-12-31. Retrieved 2011-11-12. ^ "Independence Day: We are Pakistanis now, say Afghans". Express Tribune. 15 August 2011. Retrieved 16 November 2011. ^ "People's Daily Online – Authorities launch report on registered Afghans in Pakistan". English.peopledaily.com.cn. 2007-05-04. Retrieved 2012-01-21. ^ "Pakistan offers scholarships to hundreds of Afghans". Pajhwok Afghan News. May 27, 2011. Retrieved November 12, 2011. ^ "Pakistan: Taliban threaten co-educational schools « RAWA". Rawa.org. Retrieved 2012-01-21. ^ "Afghan Refugees Schools in Pakistan". Desktop-documentaries.com. Retrieved 2012-01-21. ^ "100,000 Afghan carpet-weavers work in Pakistan". Pajhwok Afghan News. May 27, 2011. Retrieved October 11, 2015. ^ "Afghan refugees in Karachi face trifecta of woes". Central Asia Online. Retrieved 2012-01-21. ^ "FBR to tax Afghan traders working in Pakistan". Thenews.com.pk. Retrieved 2012-01-21. ^ "SCCI welcomes FBR's decision to tax Afghan traders". Thenews.com.pk. Retrieved 2012-01-21. ^ APP. "Fighting disease: Gilani blames refugees for polio spread – The Express Tribune". Tribune.com.pk. Retrieved 2012-01-21. ^ AFP (2011-04-07). "Afghanistan cricket teams play in Pakistan – The Express Tribune". Tribune.com.pk. Retrieved 2012-01-21. ^ a b Donati, Jessica (July 15, 2010). "Afghan families flee persecution in Pakistan after school attack: IOM". Guernicamag.com. Retrieved 2015-09-30. ^ "Guernica / By Bread Alone". Guernicamag.com. July 15, 2010. Archived from the original on January 7, 2012. Retrieved 2012-01-21. ^ Dotani, Abdul Nasir (2012). "The Impact of Afghan crisis on Pakistani Society since 1979 till date" (PDF). global-studies.doshisha.ac.jp. Archived from the original (pdf) on 2014-01-06. Retrieved 2012-01-21. ^ Shahzada Zulfiqar, ed. (April 24, 2011). "BNP rejects census in Afghan refugees' presence". Pakistan Today. Retrieved 2012-01-21. ^ Muralidhar Reddy, ed. (May 13, 2005). "Pakistan's Afghan problem". The Hindu. Retrieved 2012-01-21. ^ a b Ahmad, Riaz (3 April 2015). "No country for old Afghans: 'Post-1951 immigrants to be considered illegal'". The Express Tribune. Retrieved 4 April 2015. ^ "Afghanistan, Pakistan move toward prisoner exchange". Pajhwok Afghan News. June 16, 2011. Retrieved November 12, 2011. ^ "Afghans caught with fake Pak passports – Times Of India". Articles.timesofindia.indiatimes.com. March 28, 2007. Retrieved 2012-01-21. ^ a b "Dual nationality: 278 Afghans held for possessing Pak CNICs". Express Tribune. May 14, 2012. Retrieved 16 May 2012. ^ "Passport office raided: FIA arrests 11 Afghans". Express Tribune. 27 December 2012. Retrieved 27 December 2012. ^ "Extreme measures: 'Go Afghani Go' campaign launched in Haripur". The Express Tribune. 24 July 2016. Retrieved 25 July 2016. ^ "Action against Afghan refugees on the cards". Thenews.com.pk. June 14, 2011. Retrieved 2012-01-21. ^ Haider, Ziad (2005). "Sino-Pakistan relations and Xinjiang's Uyghurs: Politics, Trade, and Islam along the Karakoram Highway" (PDF). Asian Survey. 45 (4): 533. doi:10.1525/as.2005.45.4.522. Archived from the original on 2013-02-11. ^ "Heroin and the Taliban". Opioids.com. 2001-10-02. Retrieved 2012-01-21. ^ "Pakistan blames Afghan refugees for Rabbani's murder". The Express Tribune. December 14, 2011. Retrieved 14 December 2011. ^ "Policy rethink: Government to redraw key pacts with US". Express Tribune. December 14, 2011. Retrieved 14 December 2011. ^ "246 Taliban arrested from hospitals within a month". Pak Tribune. October 3, 2003. Retrieved June 3, 2012. ^ "Manawan attack: Afghan jailed for 10 years". Dawn News. Retrieved June 3, 2012. ^ "DG Khan shrine bombing: Death toll reaches 50". Express Tribune. April 4, 2011. Retrieved June 3, 2012. ^ "PAF base attack planned in Afghanistan: DG ISPR". Express Tribune. 18 September 2015. Retrieved 18 September 2015. ^ Gishkori, Zahid (9 April 2015). "10 madrassah students arrested in Lahore before being trafficked to Kabul". The Express Tribune. Retrieved 9 April 2015. ^ a b "Taliban moving to Quetta from FATA". Express Tribune. September 11, 2011. Retrieved September 11, 2011. ^ "30,000 Afghans left Pakistan after Army Public School attack: IOM". Dawn. 8 February 2015. Retrieved 8 February 2015.